While people attend Tampa Bay Meetings at the Convention Center Tampa and stay at Tampa Bay Hotels and Tampa Bay Resorts it is always interesting to see what is happpening in other parts of the hotel industry. Even though a specialty line through any of these brands probably will not appear in the Westshore District you should be thankful that you won&apos;t have to build a bath of hot chocolate for a customer staying here in Tampa Bay! Lost amid the hammering the hotel industry has been taking lately, there&apos;s a building boom. Big hotel chains like Hyatt, Marriott and Starwood are rolling out lines of specialty hotels. What most hotels call the lobby, the new W Boston hotel calls its "living room." Plunk down in one of the leather pods, and you can admire the polished granite floors by leaning back and seeing them reflected in the mirror on the ceiling. In the evening, the staff turns the lights down and the music up. W is part of a big hotel company called Starwood. 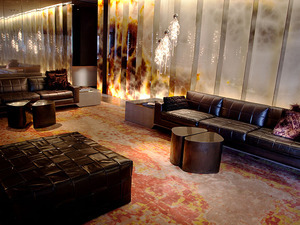 This new location is the latest in a growing trend of so-called contemporary lifestyle hotels. Hyatt&apos;s line is called Andaz, and Marriott has Edition. The idea is to lure customers bored with mainstream hotels. W&apos;s global brand manager, Eva Ziegler, takes her job very seriously. "We want to provide access to a world of wow," she says. "Basically, help you to escape from the fears and from the [mundanity] of everyday life, and come into a world where everything is possible." That might sound attractive, if you can afford it. The W&apos;s room rates in Boston start at around $200. Hotel staffers wear designer outfits and no name tags, because they&apos;re just as cool as you. They&apos;ll get you anything you want — as long as it&apos;s legal. The hotel&apos;s general manager, Bill Bunce, remembers the customer who wanted a hot chocolate bath. "And so to get all of that ready and get it in the tub and marshmallows floating — and they wanted it hot, too, which is even more difficult to do," he says. "But we were able to do it." Of course, it also went on the customer&apos;s bill. "That&apos;s the other key part to it, too," says Bunce, laughing. "Whether they want to pay the price. You could tell me whatever you want. I can deliver it, but there&apos;s a price attached to it." The Market restaurant in W Boston is part of a newly opened boutique hotel that is owned and operated by Starwood Hotels & Resorts. Reed Woodworth, a hotel industry analyst for PKF Consulting, says occupancy is down nationwide even as hotels have been cutting rates. "It&apos;s a particularly difficult time to be opening up a luxury, high-end hotel in an economy that we&apos;ve had for the past year now," he says. But Woodworth says the hotel companies remember that before the recession, consumers were willing to pay about $80 more to stay in these newer, cooler hotels that don&apos;t feel like a chain — even though they are. The hotel companies are betting on that demand coming back. "W Hotels basically doesn&apos;t build hotels today for tomorrow," says Ziegler. "It builds hotels for the long term. So when the economy comes back, it also means we will own the upswing." Woodworth says investing in new locations during a downturn can keep customers loyal and interested. But it&apos;s risky. "It&apos;s still pretty much the wisdom in the hospitality world that this is going to be a rather slow climb out of this hole," he says. "So while they are riding the upswing as it were, it still looks to be a very gradual upswing over the next few years." That means it could be a long time before these hotels make money. After all, people have gotten used to paying low rates for high-end hotels. It&apos;s going to take a while to convince consumers to pay the high prices they used to pay for these kinds of hotels — even with the lure of hot chocolate in the bathtub.